Codex Born is the sequel to Libriomancer, which caught my notice first because of how the magic was envisioned. I really hope no one is surprised that I am a book nerd by now. 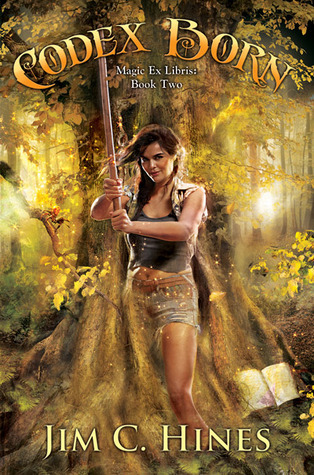 So on first glance Codex Born is a very enjoyable fluffy fantasy novel. Do not be deceived. Yes, there are magicians fighting foes with the works of Pratchett and a flaming spider that likes to chase laser pointers. The book is delightful, clever, amusing, and perhaps it even is a little fluffy at times, but it also skillfully handles delicate and dark situations. The story alternates between the here and now told by Libriomancer Isaac Vainio and the past and introspection told by Dryad Lena Greenwood. The two of them become entangled against a plot that threatens to rip apart the world as we know it, hinging on subverting both book born magic and the book born Lena. Perhaps one of the things I appreciate most is how Hines has written and explored Lena as a person. I want to specify "as a person" because it could have been very easy for an author to have failed on that. Lena is in many respects an accident, a dryad from a Gor-knockoff novel who's whole being is shaped by the desires of her partner and was born in the 'real world' through magical shenanigans. Libriomancer one provided a vehicle for Lena to become a person distinct from her lover, to conflict with their ideals. Codex Born takes this further and explores Lena's journey of discovery and growth, while exploring the dynamics of relationships and power. I can't imagine it's easy to write about abusive relationships in a believable way, whether about being in one or about encountering one. I really enjoyed Codex Born and look forwards to book three.